Evolving Zombies | 2P START! Well, as you can see, Ray is back in action and I couldn’t be happier. For the record, I really want to like Umbrella Chronicles, but I just had to make fun of the game at this stage because of how incredibly easy it looks. 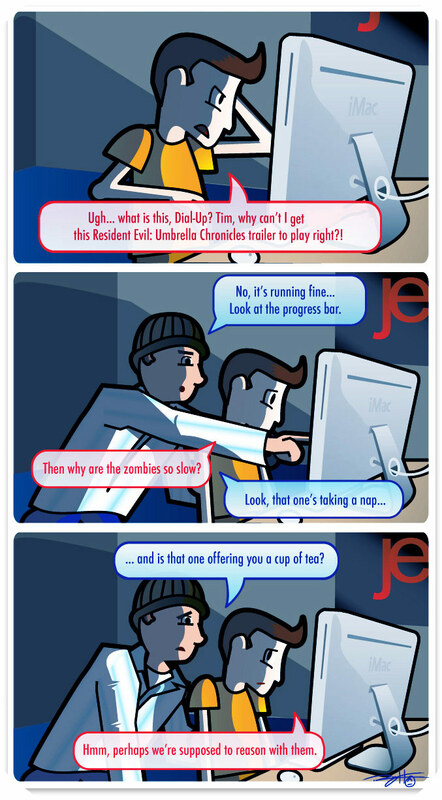 I just picture myself playing this game, alternating between killing a zombie and sipping my coffee. What made House of the Dead a good game was the frantic pace, the projectile chain saws, the fact that zombies just popped up right in front of your face. The trailer of RE:UC makes it seem like we’ll be on a first name basis with the zombies by the time we have to kill them. I’ll admit that the game does look pretty and sports the same bad, B-movie voice acting that House of the Dead has, so if they just speed the game up it should be a lot of fun. Why don’t you wait to play the game before judging it? Didn’t you read the post? I do hope this game turns out alright, I was just judging the trailer. I’m a huge fan of House of the Dead games, so I have high hopes for RE:UC. I don’t recall Resident Evil ever being hard because of the Zombies (RE4 excluded of course). On a mac huh? Jeez when you guys get all annoyed that you don’t find a particular comic funny, just go buy a newspaper and try reading those. I thought this one was pretty funny. But chances are the trailer only shows earlier levels where the game is easy and not levels where the difficulty increases. Plus RE4 had difficulty settings, and so UC might too. Haha, HIL-ARIOUS! Well, pretty funny anyway. I though it was funny. I’ve never played any Resident Evil games. I just thought the concept of zombies taking naps and offering you tea was funny. I have the game and is was All right for me, the most important thing to me is that gives chance for other players who didn’t like the gameplay of the first games or they are only have played the RE4 and want to know the complete story. I just started reading this comic and noted that a lot of people have a lot of negative thins to say. If so many of you don’t like the comic, there is a simple solution. Stop reading it. Leave the site alone. Damn. Um…having now played Umbrella Chronicles…I can comment on this. You’re wrong. haha. The game is freaking hard!!! Darkside Chronicles on the other hand is quite fun!